If you have projects created from beforehand. 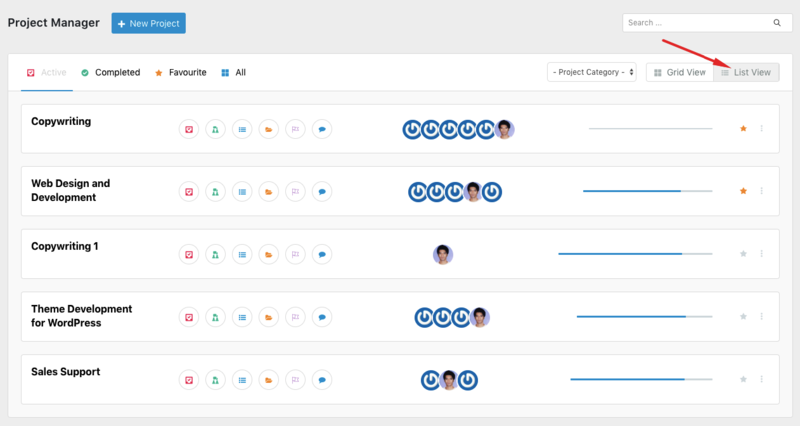 You can go to the WP Admin Dashboard → Project Manager → Projects to see the project dashboard. Here you will be able to see all the projects that you have created. 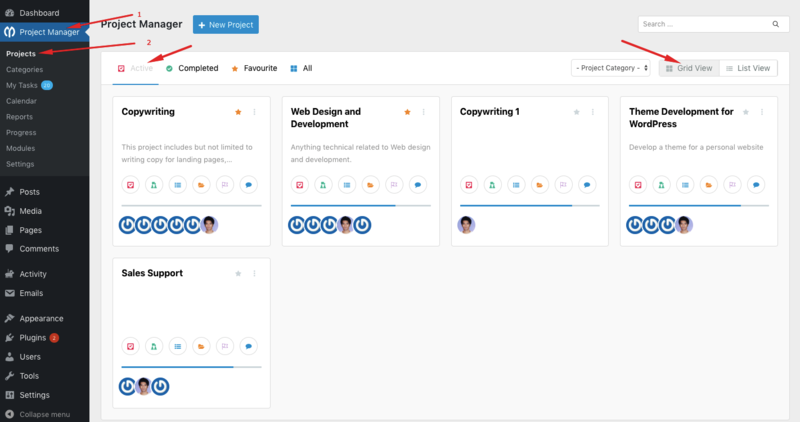 By default, you will get to see the active projects with a grid view. However, you can select the completed option to view the completed projects. You can also change the Grid view option to List view. There is also a ‘Favorite‘ option to mark a project as a favorite to set priority when it comes to the appearance on the list. Also choosing a project category will only show the projects belonging to that particular category. There is also a global search bar to help you get to a project, task, task list or subtask quickly. You can use the shortcut buttons to get to a task, tasklist, subtask and so on. You will be able to view the progress of a project with a progress bar. 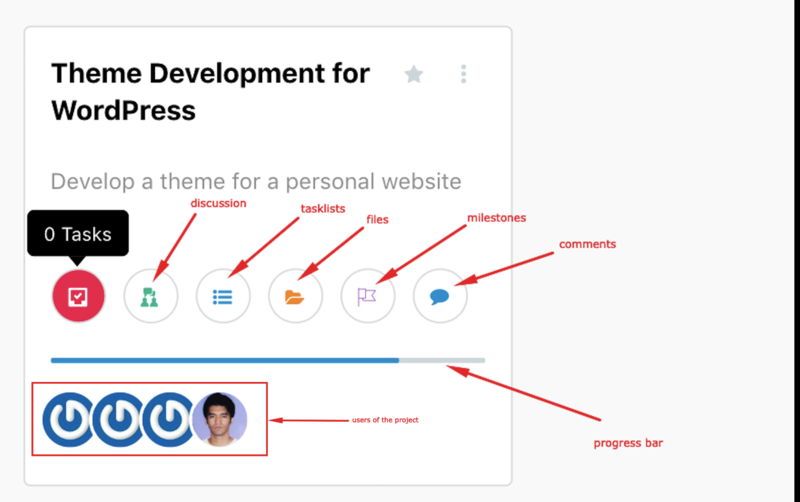 When you hover on an icon you will see a tooltip demonstrating a brief overview. 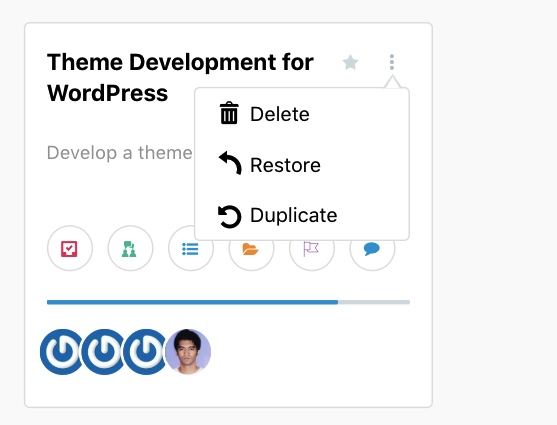 Use the three vertically aligned dots to delete, restore and duplicate a project. Creating a project is only a matter of a few seconds. You can create a project in just two steps. Go to WP Admin → Project manager → Projects → New Project. When creating the new project, you can add project categories from a drop-down. Adding a category to a project is optional though. To select a category for a project, you must create categories beforehand. You can also add all the co-workers right from this modal window and if you check to notify, they will receive email notifications. When you finish filling out the fields, hit the “Add New Project” button to create the project. That's how you can create projects in WP Project Manager. Note: Whenever you are naming a new project, try to give it a unique name because you can not create projects with the same name.